and thorns and stars you’ve tattooed across my arms and my chest; but maybe these thoughts and feelings are too scattered for song. so maybe i’ll write these uncaged words instead. i ran into something unbelievable last winter. it came into our lives in the fall. and it grew and grew. and by winter, it was so huge, that the whole world had to morph and widen and brighten to fit it. this morphing, and widening, and brightening was a journey filled with light and dark, learning and growth, hope and doubt, dreams and rude awakenings, shock and wonder. these poems and lyrics and words are a documentation of that journey. 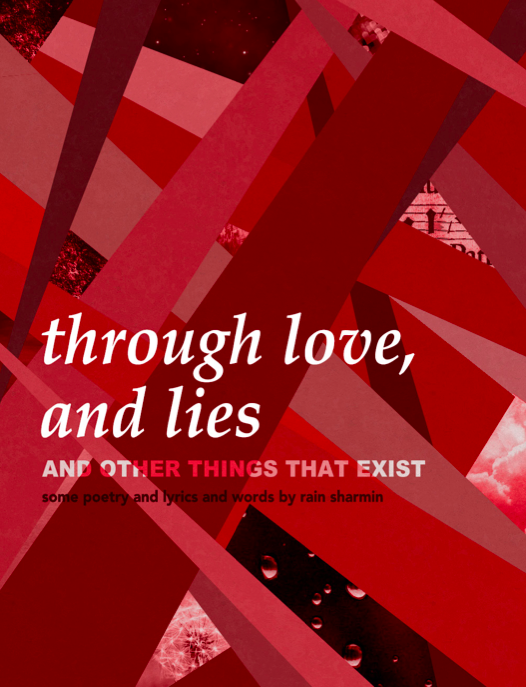 a journey through love, lies, and other things that exist.